Midnight is a two-year old cat that snuck out an open door. 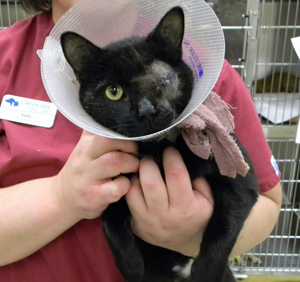 He came home with an awful animal wound that left his eye out of socket. This wound was in such bad condition that when we approved Midnight for his vet visit the vet dropped everything to attend to his surgery immediately! Midnight will have to adjust his balance and perception with only one eye, but should make a full-recovery.